1. A network designer is considering whether to implement a switch block on the company network. What is the primary advantage of deploying a switch block? The failure of a switch block will not impact all end users. 2. Which characteristic would most influence a network design engineer to select a multilayer switch over a Layer 2 switch? 5. A set of switches is being connected in a LAN topology. Which STP bridge priority value will make it least likely for the switch to be selected as the root? 6. Refer to the exhibit. Which switch will be the root bridge after the election process is complete? 7. Refer to the exhibit. What are the possible port roles for ports A, B, C, and D in this RSTP-enabled network? 8. A network administrator enters the spanning-tree portfast bpduguard default command. What is the result of this command being issued on a Cisco switch? Any switch port that has been configured with PortFast will be error-disabled if it receives a BPDU. 9. Refer to the exhibit. A network administrator is configuring PVST+ for the three switches. What will be a result of entering these commands? 10. Refer to the exhibit. 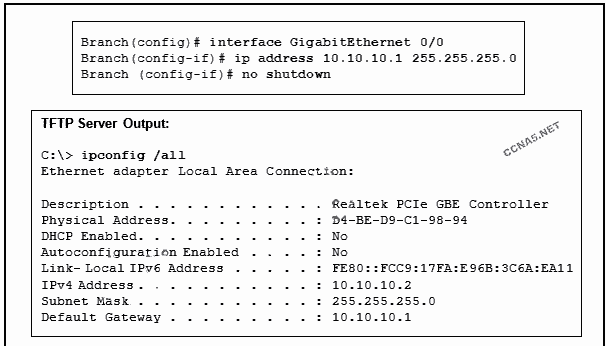 Which destination MAC address is used when frames are sent from the workstation to the default gateway? 11. A network administrator is analyzing the features that are supported by different first-hop router redundancy protocols. Which statement is a feature that is associated with GLBP? 12. A network administrator is analyzing the features that are supported by different first-hop router redundancy protocols. Which statement describes a feature that is associated with HSRP? HSRP uses active and standby routers. 13. Which function is provided by EtherChannel? 14. Which mode configuration setting would allow formation of an EtherChannel link between switches SW1 and SW2 without sending negotiation traffic? The port channel ID is 2. Clustering mode must be enabled on the APs. The APs have to be connected on the same network segment. 19. A remote classroom can successfully access video-intensive streaming lectures via wired computers. However, when an 802.11n wireless access point is installed and used with 25 wireless laptops to access the same lectures, poor audio and video quality is experienced. Which wireless solution would improve the performance for the laptops? 20. Which wireless network topology is being configured by a technician who is installing a keyboard, a mouse, and headphones, each of which uses Bluetooth? 22. At a local college, students are allowed to connect to the wireless network without using a password. Which mode is the access point using? 23. Which wireless encryption method is the most secure? 24. Users on an IEEE 801.11n network are complaining of slow speeds. The network administrator checks the AP and verifies it is operating properly. What can be done to improve the wireless performance in the network? Split the wireless traffic between the 802.11n 2.4 GHz band and the 5 GHz band. 26. Refer to the exhibit. When the show ip ospf neighbor command is given from the R1# prompt, no output is shown. However, when the show ip interface brief command is given, all interfaces are showing up and up. What is the most likely problem? R1 or R2 does not have a network statement for the 172.16.100.0 network. Use the passive-interface command on LAN interfaces that are connected only to end-user devices. Enable the OSPFv3 routing process on the interface connected to the remote LAN. 29. Refer to the exhibit. A network technician is troubleshooting missing OSPFv3 routes on a router. What is the cause of the problem based on the command output? There is a problem with the OSPFv3 adjacency between the local router and the router that is using the neighbor ID 2.2.2.2. 30. When does an OSPF router become an ABR? 31. Which type of OSPF LSA represents an external route and is propagated across the entire OSPF domain? 32. Refer to the exhibit. What can be concluded about network 192.168.1.0 in the R2 routing table? Routes within an area are summarized by the ABR. ABRs advertise the summarized routes into the backbone. 34. Refer to the exhibit. A company has migrated from single area OSPF to multiarea. However, none of the users from network 192.168.1.0/24 in the new area can be reached by anyone in the Branch1 office. From the output in the exhibit, what is the problem? There are no interarea routes in the routing table for network 192.168.1.0. 35. When are EIGRP update packets sent? The packets are sent as unicast. 37. Refer to the exhibit. 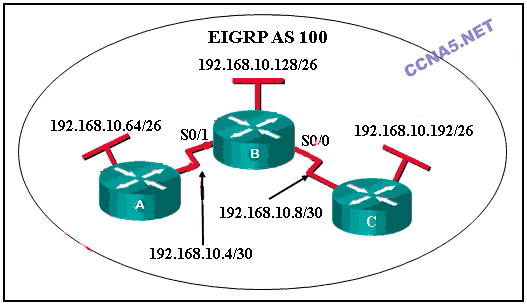 If router B is to be configured for EIGRP AS 100, which configuration must be entered? 38. An administrator issues the router eigrp 100 command on a router. What is the number 100 used for? 39. A network administrator wants to verify the default delay values for the interfaces on an EIGRP-enabled router. Which command will display these values? There is one feasible successor to network 192.168.1.8/30. Router R1 has two successors to the 172.16.3.0/24 network. 42. When will a router that is running EIGRP put a destination network in the active state? 43. Which address is used by an IPv6 EIGRP router as the source for hello messages? 44. Refer to the exhibit. A network administrator issues the show ipv6 eigrp neighbors command. Which conclusion can be drawn based on the output? 46. By default, how many equal cost routes to the same destination can be installed in the routing table of a Cisco router? 47. 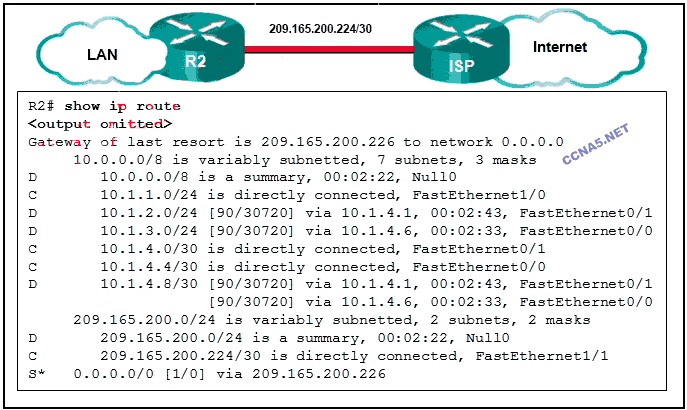 When a Cisco router is configured with fast-switching, how are packets distributed over equal-cost paths? 48. Refer to the exhibit. Router CiscoVille has been partially configured for EIGRP authentication. What is missing that would allow successful authentication between EIGRP neighbors? The keychain for EIGRP authentication must be configured on the interfaces. 49. When should EIGRP automatic summarization be turned off? 50. Refer to the exhibit. 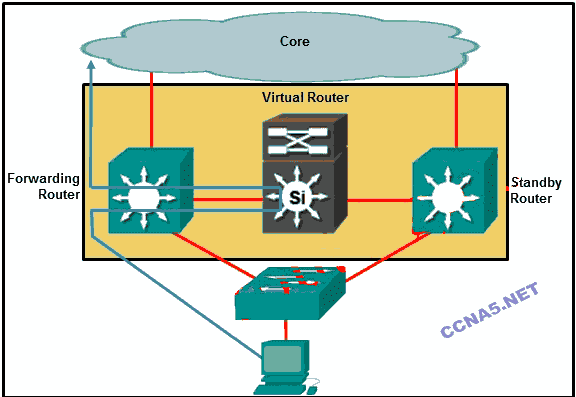 Routers R1 and R2 are directly connected via their serial interfaces and are both running the EIGRP routing protocol. R1 and R2 can ping the directly connected serial interface of their neighbor, but they cannot form an EIGRP neighbor adjacency. 52. Which requirement should be checked before a network administrator performs an IOS image upgrade on a router? There is sufficient space in flash memory. 53. Refer to the exhibit. A network administrator is attempting to upgrade the IOS system image on a Cisco 2901 router. After the new image has been downloaded and copied to the TFTP server, what command should be issued on the router before the IOS system image is upgraded on the router? 54. What is the purpose of the Cisco PAK? It is a key for enabling an IOS feature set. 55. Which Cisco IOS Software Release 15.0 technology pack is shipped with a permanent license on all Cisco ISR G2 devices? 56. A network administrator issues the command R1(config)# license boot module c1900 technology-package securityk9 on a router. What is the effect of this command? The Evaluation Right-To-Use license for the Security technology package is activated. 58. Fill in the blank. The​​​ ​​ (backbone, BACKBONE) area interconnects with all other OSPF area types.